Here on Making Sense of Cents, we talk a lot about making extra money. 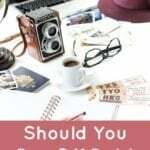 While I am all about a person cutting their expenses (this is one of our main goals this year), there is a lot to be said about using your extra time to make extra money. 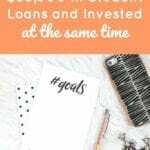 Due to my past side hustles (most of which now comprise my full-time business), I was able to pay off my student loans completely, travel, quit my job, start my own business, and more. Side hustles have completely changed my life for the better, and this is why I think more people need to look into making extra money on their own. Even if you think you don't have enough time to make extra money, I'm sure you have at least a few hours each week. Dedicating something as little as a few hours each week can still mean enough time to make extra money each week. 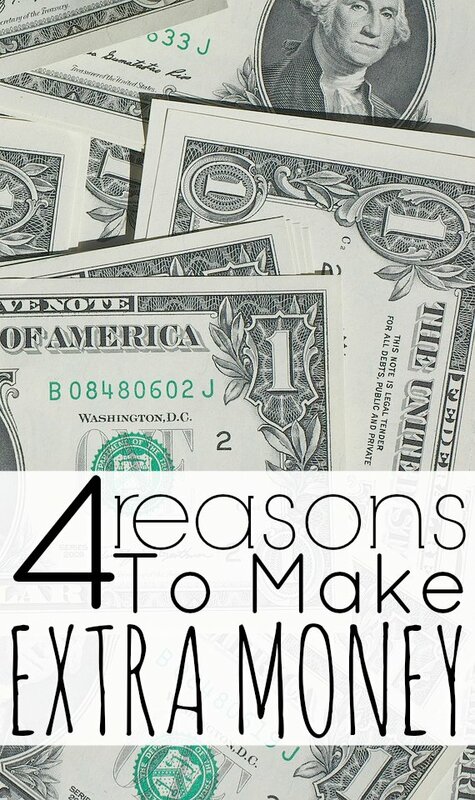 Below are four reasons you should be making extra money. 1. Extra income can be used towards debt. Debt was my main motivator for making extra money. While I made a good salary at my day job, it wasn't enough to where I could continue to live the life I wanted as well as pay off my debt quickly. I didn't want to be buried in debt forever, so paying it off quickly was a big goal of mine. I realized the only way I could pay off my debt quickly was to build up my extra income streams. Making extra money definitely helped with my debt goal. I was able to pay thousands of dollars extra each month from my side income streams. While that may seem impossible to you, I promise it is not. I have had many people email me tell me that they too thought it was impossible until they worked hard towards their side hustles. In fact, I recently received an email from a reader who paid off $25,000 of their student loan debt in less than one year due to side hustles. They thought it was impossible but then they realized that they could do it too! 2. You can reach a financial goal quicker if you make extra money. Are you trying to reach any financial goals? Maybe you want to save money for a vacation, build up your emergency fund, add to your home down payment fund, or reach retirement quicker. Whatever your goal may be, making extra money can help you reach your financial goals faster. Like I said earlier, cutting your budget is great, but making more money is even better. Earning extra money can allow you to save more money. This is because you can only cut your budget by so much, whereas you can grow your income by an endless amount. What I like about earning extra money is that you can use all of your side money and throw it at a goal. This way you aren't really “missing” your money as much as it is all “extra” anyways. 3. You can test out a business idea when making extra money. This can be a great idea because you can fully test the waters of your new business on the side, while still having the stability from your full-time day job. You can see whether you like your business idea, whether it will truly work out, if you can make an income from it, and more. I know first hand about this. My side hustles turned into my full-time business. While I didn't start my side jobs thinking that they would eventually turn into a business, it was a great way to start as I was still able to keep my day job income and benefits while seeing if it would work. It took a lot of stress away this way. 4. Making extra money can help you diversify your income. Maybe you are afraid that one day you may lose your job or that something will happen to your main source of income. 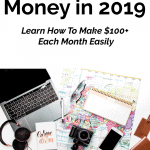 If you work towards building up side income streams and diversifying your income, then you won't really have to worry about one of your income streams having a bad month or completely disappearing. By diversifying your income with multiple income streams, you will have a back up plan. 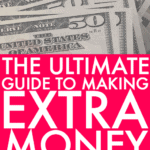 Do you make extra money? Why or why not? How much time do you spend on making extra money? Great tips! 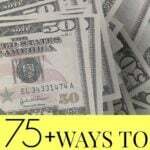 These are all really good ideas for saving and how to put the savings to good use! Paying debt off quickly is a big goal for me too. Having an extra money to pay off your debt would be a good help. I do make some side money, from various sources. I sell children’s books via a small business and on Amazon, a couple of times a year I teach classes in resume writing and interview prep, and I do things like taking surveys (while watching TV), that bring in small amounts of easy money. I really like the points you made here, especially the idea of not “missing” your regular money if you’re using “extra” money to pay off debt. Sounds like you have a lot of side hustles. Great job! This is why I started my freelance writing business as a side hustle; try it out first, pay off some debt and prepare to take the plunge to full-time. Good tips Michelle! I’d definitely like to make enough extra money to really bolster one of my financial goals (in particular, helping supplement my house down payment). That said, I’ve found that for me at least, the side hustle thing can be a pretty tough slog. What side hustles do you currently have? My biggest reason to make extra money is to finally get out of debt! I can’t wait to get rid of that extra stress! This is a great reason! What do you currently do to make extra money? I do online surveys,Toluna and Inbox are keeping me busy. RewardsTV is great, I’ve gotten 2 $25 gift certificates for Kmart in the last 6 weeks! I use Ibotta, Receipt Hog, and Snap By Groupon. My best idea has been becoming an Independent Consultant with Paparazzi Jewelry! I’m getting ready for a show right now! With 45% commission, it’s been a fun side hustle that I hope keeps growing. (Shameless plug: shop.paparazziaccessories.com/32056)!! Good job with all the side hustles! I love making extra money =) I no longer have a side hustle, but I still try to grow my earnings as much as I can. At this point, it just means we get closer to FI. We are in the same place. We don’t do much for extra income anymore. I am working on making extra money…but man its hard with 2 kiddos taking up most of my time during the day! Thank for the reminders of why I am doing this (down payment here we come!). I know that even an extra $25 to the down payment fund will make a big difference over the long run! Making extra income is never a bad thing. My “9-5” or more like “9 to at least 7” takes up a lot of my time. And then I won’t really bend on working out four times a week which takes at least 4-6 hours a week. So the extra money I would earn would have to come from a source that I found enjoyable and willing to part with my free time for. 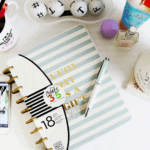 Yes, finding an enjoyable side hustle can make a huge difference. These are some good reminders to keep hustling. I’ve been lazy about my side hustles lately and I really want to change that. I want financial independence, to go on family vacations, be debt free, and be able to finance my kids college educations without them leaving with a ton of debt like I did. That is a lot of hustling. Yes, that’s a lot of hustling. What type of hustles do you currently do? Currently I am substitute teaching & creating pre-k printables for purchase at teacherspayteachers and teachersnotebook. I’ve been trying to break into tutoring for a while now, but no go. As a former teacher I’ve only ever tutored my own students, but people typically are not looking for tutors at the elementary or middle school level, just HS. I consider being a stay at home mom and homemaker my “full time job” and everything else is extra. I think I need to get more creative about my avenues for my hustles. Subbing & printables are decent money, but I really want to amp it up a bit. Sounds like you have some good side hustles there. I hope you are able to increase them to the level you want to be at. You can do it! Great tips! I started my side hustle last year in July and I’ve been able to pay off 2 credit cards already this year (2015) ahead of schedule due to my side hustle income. I agree – too many people don’t give side hustling a chance. I 100% side hustle to have a back up plan to my main source of income. I toss it all in savings because my primary job covers my bills and then I know if I were to ever lose my job I’d still be bringing in some cash while I searched for another. It feels good to “recession proof” your life. Yes, having a side hustle is a great way to diversify your income. Living debt free is so important to me! Thanks for your inspiration. I have a few side hustles. You know about a couple of them :). That money is used to pay off debt and to pay for trips. I plan to use side hustle money to pay for FinCon. Oooh you’re going to FinCon?! It’s all about the side hustle. Though maximizing your day job matters too. At my age, I earn extra money as much as I want. #YOLO Right Michelle? I especially like tip #4. I never really thought I would need income beyond my day job, but instead of having 100% of my income come from one source, it feels a lot more satisfying to have it come from multiple sources. That way I know that if something happened to me where I couldn’t work at my primary job, I could jump right into my other source and just crank it up. Great post. Yes, this is a great reason to build some side hustles. Even though I retired early I am always open to opportunities that I am interested in doing or passionate about. I think we should always be on the lookout for ways to earn a little extra. My early retirement side hustle is coming to an end mid-May and although I am very excited to return to retirement full-time again I know it won’t be long before something comes along I might want to try and do. Once the side-gig gets into your blood its always there. I worked multiple jobs for years when my kids were young to just make ends meet. Its much more enjoyable finding and doing side work or income when you do it because you want to not necessarily have to. All great ideas! Paying off debt is our one big goal right now. I think making extra money needs more smartness than hard work.